Celebrate Memorial Day by honoring the lives and sacrifice of our servicemen and women! 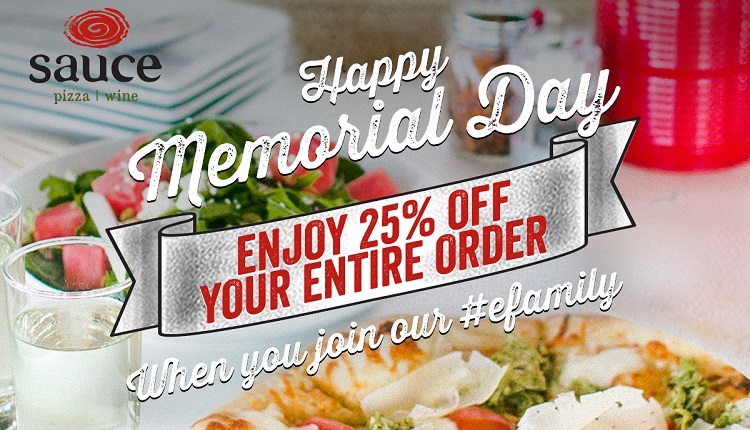 To show our gratitude we will be offering 25% off to all e-family members when dining with us on Monday, May 28th. Bring your friends & family and show your support by taking the time to enjoy the sweeter things in life – like pizza, wine and delicious desserts! Sign up for our E-Family to redeem this exclusive offer. * Valid at any Sauce Pizza & Wine location (excluding Sky Harbor airport). Valid for dine-in and take out (excludes online 3rd party delivery). May not be combined with any other offers or discounts. No cash value. Print this email or show us your mobile device to redeem offer. Valid only on 5/28/18.